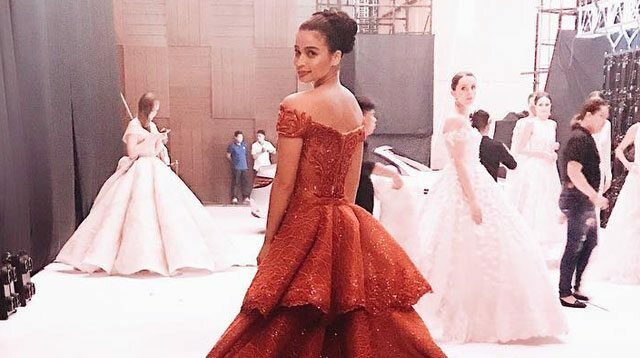 At the "Marry Me At Marriot" bridal event on July 24, Anne Curtis stole the show in a dramatic red Michael Leyva gown. The actress glided down the runway for the finale for the designer's presentation—and our jaws definitely dropped. Serves as practice for her own walk down the aisle, right? …but the front is just as gorgeous! It features a plunging off-shoulder neckline and intricate details running down the bodice. Without the detachable train, the gown's mermaid silhouette comes into focus to perfectly accentuate Anne's figure. To complete the look, Raymond Santiago styled Anne's hair in a high braided bun, while Gery Penaso kept her makeup understated and elegant—just as how any bride's should be.